Landers Chrysler Dodge Jeep Ram of Norman, Oklahoma has an awesome selection of Dodge Durangos for sale! Large and in charge, the 2019 Dodge Durango has finally arrived on the scene with a whole lot of attitude. Featuring a bold, aggressive style that highlights incredibly powerful performance under the hood, the 2019 Dodge Durango was most certainly worth the wait. Capable, functional and totally connected, the brand-new Dodge Durango is simply exciting to behold — so let’s take a closer look! Jump straight to our inventory by clicking here! Technology: The 2019 Dodge Durangos have two different, but equally amazing, infotainment systems perfect for all drivers. The standard UConnect 4 system includes a brilliant 7” touchscreen, Android Auto and Apple CarPlay compatibility, integrated Voice Command, Bluetooth streaming, and SiriusXM Satellite radio. If you opt for the Uconnect 4C Nav system, you’ll receive all of the above features on an 8.4” touchscreen as well as SiriusXM Guardian, SiriusXM Traffic Plus and SiriusXM Travel Link to boot. Available USB and HDMI ports also ensure that everyone can have a great time whenever they’re riding in the all-new Dodge Durango. 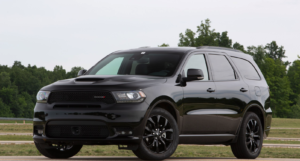 Performance: When it comes to powertrains, each new Dodge Durango model has its own: the Dodge Durango SRT features a mighty V-8 engine that delivers 475 horsepower, the Durango R/T and Citadel sport a 5.7-liter V-8 that tops out 360 horsepower, while both the Durango GT and SXT house a 3.6-liter V-6 that generates 295 horsepower. All of that mighty power means the 2019 Dodge Durango is a master hauler and tower. The all-new Durangos can tow anywhere from 6,200 to a whopping 8,700 pounds depending on the model you choose! Arriving standard in all five models of the new 2019 Dodge Durango lineup will be an integrated trailer brake when drivers select the optional Trailer Tow Package. Other features like Trailer Sway Control and a near-perfect 50/50 weight distribution mean the 2019 Dodge Durango makes the toughest of jobs a piece of cake. Ultimately, the Dodge Durango stays tough with incredible performance all the way around. Design: The 2019 Dodge Durango lineup also receives some fun and exhilarating updates to its design, including color options of eleven unique choices: Vice White, Billet, DB Black, Granite, Destroyer Gray, Redline Red, Octane Red, Reactor Blue, White Knuckle In-Violet, and F8 Green. Also standard on the all-new Dodge Durango comes the Class-Exclusive LED racetrack taillamp which features 92 individual LED lights blending together to form one bold, brilliant beam of light. The Durango GT is the only model to get physical exterior updates–receiving the same performance front fascia as the R/T and SRT. Each of the five models also gets a slew of interior upgrades which are covered in Fiat Chrysler Automobiles’ press release here. Want to add a racing-inspired edge to the all-new Dodge Durango? Opt for the Mopar Dual Stripes and no one would think twice about challenging you on the road! Want to learn how to get your hands on one of these sweet new 2019 Dodge Durangos? Just click here to visit our website and contact us–we’ll get you in the Dodge of your dreams!